100 years of stagnation and dirty. Who would finance celebrating this rubbish? The Lusaka City Council has deferred the 100 years centenary official launch to an unkown date due to financial blues which has hit the PF central government and associated institutions. Lusaka City was established as a settlement in 1913. This is the same Council which plans to borrow US$500 million through municipal bond. 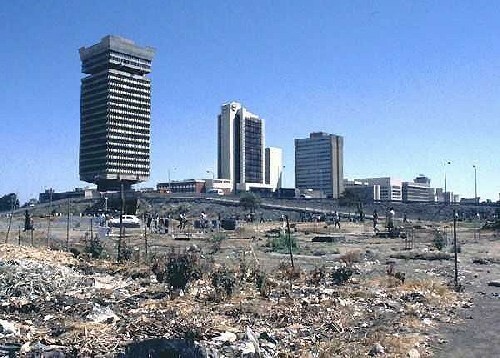 We understand the Kongole people from rating agency, Fitch, are already in the country to assess the credit worthiness of Lusaka City Council (LCC). We wonder what is going through the minds of these officials when they see the disorder and general dirty in Lusaka. LLC Public Relations Manager, Chanda Makanta explained that the 100 years Centenary, which was expected to be celebrated under theme ‘100 Lusaka, let’s celebrate’, was to be launched on July 1 this year. Ms Makanta explained that the deferring of the launch of the centenary has been triggered by the poor financial response that the event has received from the public. She said the local authority has since written to stakeholders and business houses seeking financial support but that the response has been bad. Ms Makanta has since called on Lusaka residents and business houses to join in the city’s100 years centenary celebrations to be held this year. She has reminded all residents of Lusaka that the celebration is important as it is not a political issue but an event to remind each other of where the city began from and celebrate the achievements and developments that have taken place. She added that Lusaka is the indigenous land for the Soli and Lenje speaking people but that it has accommodated all tribes because of the developments that have taken place since its establishment. Ms Makanta said despite being colonised by the British, residents of Lusaka today have something to smile about. She noted that the event needed the support of everyone, adding that the local council alone cannot manage because of some financial constraints and a wide range of programs that also require financial attention.